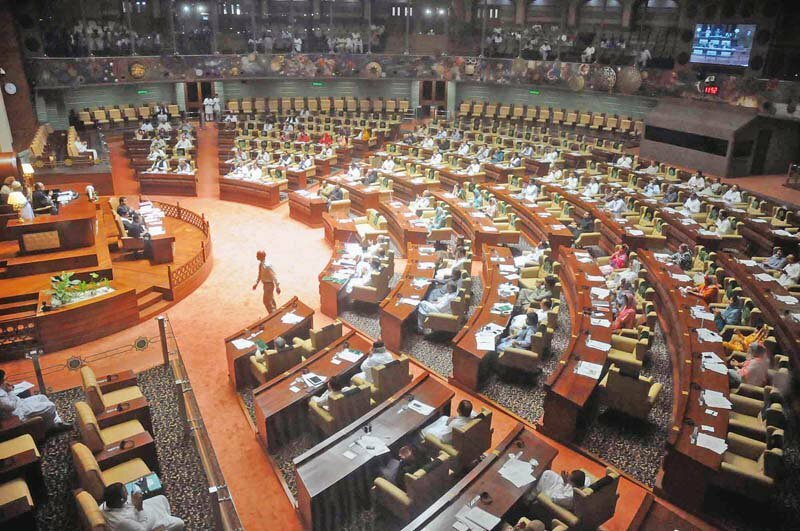 A unanimous resolution condemning the Taliban attack at Army Public School (APS) was passed by the Khyber-Pakhtunkhwa Assembly on Friday, urging the federal government to take advantage of the national consensus and eradicate militancy from the country. Opposition leader Maulana Lutfur Rehman, QWP leader Sikandar Sherpao, PML-N parliamentary leader Sardar Aurangzeb Nalutha, PPP leader Saleem Khan, ANP’s Sardar Hussain Babak, law minister Imtiaz Shahid Qureshi and senior ministers Inayatullah Khan and Shahram Khan Tarakai signed the joint resolution. 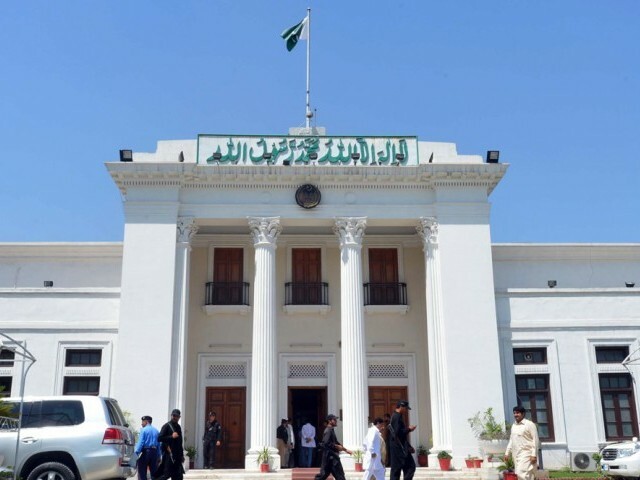 In the first assembly session since the attack took place on December 16, the house expressed condolences to the families of the fallen victims and appreciated national leaders for getting together in Peshawar and Islamabad and giving recommendations to end terrorism. “This house demands the government review the country’s foreign policy in light of the Peshawar incident and formulate an effective national security policy to improve law and order,” stated the resolution. The lawmakers also asked the government to take practical steps to ensure the repatriation of Afghan refugees and internally displaced persons to their homes. Moreover, the resolution demanded the highest civilian awards for the school’s principal Tahira Qazi who also perished in the attack, renaming of schools after the victims, and the upgradation of APS to a university. It also praised the army and security agencies for their sacrifices in the war against militancy. The session started about two hours later than its scheduled time with lawmakers offering fateha for those killed in APS attack. Addressing the house, opposition leader Maulana Lutfur Rehman said the attack on the school was a dastardly act of terrorism. “We are ashamed for failing to give a peaceful future to these children. Political parties will have to keep their differences aside for the sake of the country and take a common stand,” he said. The lawmaker claimed the government should not divert its attention to religious seminaries and take action against them as they were responsible for educating thousands of children. “2014 started in K-P with Aitzaz Hasan’s death while trying to thwart a suicide attack in Hangu and concluded with the APS tragedy,” said QWP parliamentary leader Sikandar Sherpao. The MPA urged the government to analyse the security situation properly because the impression is being created that Afghan refugees are responsible for every wrong in the country. “We should first put our own house in order. It is not wise to blame them for our mistakes and shortcomings,” said Sherpao. He added law and order was Pakistan’s foremost problem and needs to be addressed on a priority basis. “I do not agree that everything is linked with Afghans,” he said. In his speech, Minister for Local Government Inayatullah Khan said Pakistan’s destabilisation will ultimately affect peace in the world. The minister added in the aftermath of the school attack, religious seminaries are being watched and a crackdown against them is in the offing. “Seminaries should not be targeted. Only those who are involved in terrorism should be targeted,” maintained the lawmaker who is associated with the Jamaat-e-Islami. Sardar Aurangzeb Naultha, Shahram Tarakai, Syed Jaffer Shah, Anisa Zeb Tahirkheli and Saleem Khan also addressed the house. Published in The Express Tribune, January 3rd, 2014. CM Khattak lauded JI’s role in eradicating corruption and bringing positive change to the province. After opening for two days, police ordered administrations to shutdown for security. JI Ameer Sirajul Haq urges govt to resume activities at educational institutes.